How Watson and IBM Bluemix can be used to analyze trends in Minecraft behavior, and thus their personalities. 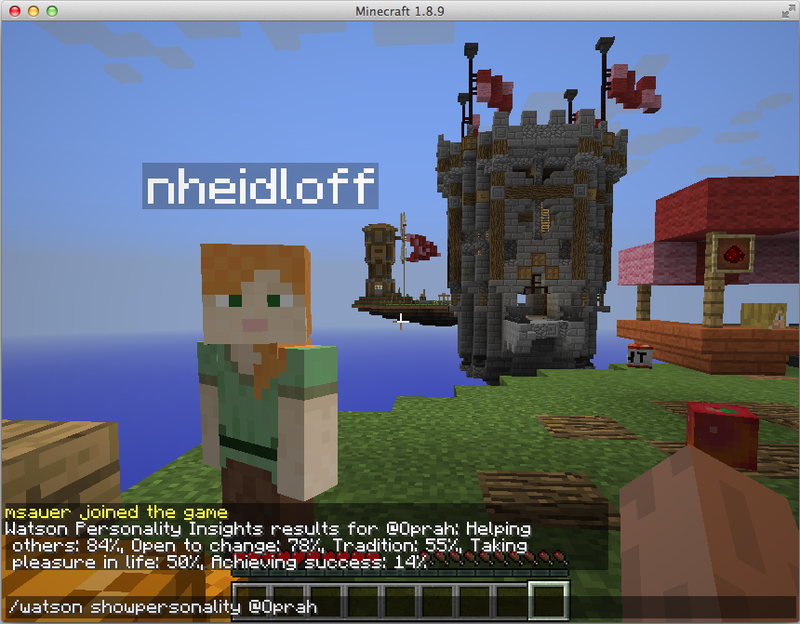 Over the holidays, I looked briefly into how to extend Minecraft and how to utilize Bluemix. In multiplayer games, it might make sense to understand the personalities of competitors or to understand the personalities of players when forming teams. The Watson Personality Insights service might help. I followed the steps in the articles to deploy a Minecraft server to Bluemix via Docker. As an example of a multiplayer game, I installed the Bedwars Reloaded plugin. The biggest problem I had was missing permissions. As a shortcut, I gave myself maximal rights in the ops.json file. The following lines are the changes and extensions I had to do to the Dockerfile. As described by my colleagues you have to turn off authentication which shouldn’t be done for production environments. Also it looks like most Minecraft plugins have not been developed as cloud native applications. Instead data and configuration is stored on disk and gets lost when Docker instances are deleted. I followed the instructions in the articles to build my own plugin using Watson Personality Insights. When you enter “/watson showpersonality @Oprah” it displays the values of that Twitter user returned by the Watson service. To make this more useful it would be good not (only) to use Twitter but also the content of previous Minecraft chats.